Fairmont, W. Va. – Noble Energy, Inc. (NYSE: NBL) today announced that it will become a founding partner, with the Community and Technical College System of West Virginia (WVCTCS), of the new West Virginia Community College Petroleum Tech Program. As a founding partner, Noble Energy will invest $250,000 as a one-time donation in the institution’s one-year certifications and two-year degree programs focused on shale exploration and production. The WVCTCS program is one of only 14 in the United States. The announcement was made at an event in Charleston, WV. 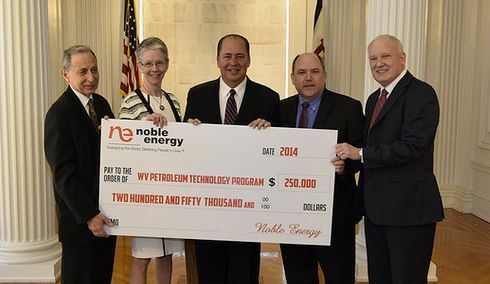 Governor Earl Ray Tomblin and Gary Willingham, senior vice president of Noble Energy’s Onshore Region were joined by the administrators and students of Pierpont Community and Technical College and West Virginia Northern Community College to celebrate the announcement. Both schools are offering the new program. Noble Energy’s contribution will help participating schools purchase equipment for hands-on training; offer scholarships; and fund recruiting efforts to attract students to the program from around the region. In addition, Noble Energy will offer internships to students enrolled in the program; provide field tours of operations and facilities; and offer employee expertise in the classroom. "This contribution from Noble Energy is a great example of how an industry recognizes and rewards a community college who ‘gets it right,’” Pierpont Community & Technical College President Dr. Doreen Larson said. “The Chancellor facilitated deep research with local and national industries and the Petroleum Technology curriculum was developed to serve the program, rather than trying to fit the program into some existing curriculum. The family of students, staff and faculty of Pierpont truly appreciate this gift from Noble Energy and we pledge to put every dime and dollar to good use." In the Marcellus Shale region, Noble Energy’s core operational and exploratory area is in Marshall, Tyler, Doddridge, Gilmer and Ritchie counties in West Virginia and Washington and Greene counties in Pennsylvania. Since commencing operations in the Marcellus Shale in 2012, more than 85 percent of Noble Energy’s Marcellus employees were hired regionally. Noble Energy is a leading independent energy company engaged in worldwide oil and gas exploration and production. The Company has core operations onshore in the U.S., primarily in the DJ Basin and Marcellus Shale; in the deepwater Gulf of Mexico; offshore Eastern Mediterranean; and offshore West Africa. Noble Energy is listed on the New York Stock Exchange and is traded under the ticker symbol NBL. Further information is available at www.nobleenergyinc.com.